The Shambling Shimmies Dance Company was born in 2010 and is directed by Jules and Heather (that’s us!) in Gainesville, Florida. The following year, we founded a business with the aim of providing access to belly dance classes and student performance opportunities in the Gainesville area. The mission of Shambling Shimmies Dance Company is to encourage sound dance technique and creative expression. We offer a limited number of drop-in classes and pre-registered courses for small groups in our home studio in SW Gainesville. We are very much a local, homegrown small business and we want to help you meet your belly dance goals and have fun doing it! Jules and Heather both study and are heavily influenced by the Suhaila Salimpour and Jamila Salimpour formats for belly dance. We’re here to help you learn how to dance more like the dancer you imagine in your head when you hear the music. Jules was introduced to dance at a young age through your typical grade-school Ballet classes, and later high school Show Choir. In the years that followed, however, she abandoned dance and focused on fitness-based movement as she majored and later worked for several years in the field of Exercise Physiology which still informs Jules’ approach to technique, training, and instruction today. In 2007, Jules rediscovered dance movement as a way to foster health, peace, and acceptance rather than discontent with both her own and others’ bodies. 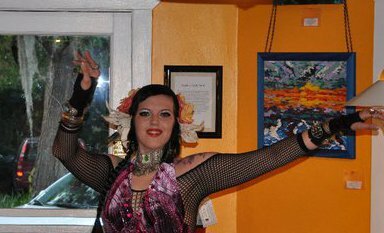 Early 2008 began her intensive study of belly dance through regular classes, DVDs, workshops, and later online classes, audio training tools, and private lessons whenever possible as well. 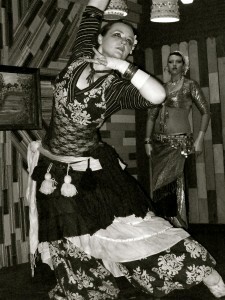 Jules’ primary focus areas have been foundational dance technique, Group Tribal Improvisation belly dance (including various props such as baskets, fire palms and staff), and Tribal Fusion belly dance. Jules is a Fusion dancer at heart and takes classes in any style of dance (belly dance or otherwise), believing that she can learn something from each one. She currently takes classes in Egyptian Style belly dance, Hip Hop, Popping, Ballet, and Swing. Jules earned Level 1 certification in the Suhaila Salimpour format in April 2013. She is currently studying Level 2 Suhaila Style technique and the Level 1 Jamila Salimpour format. Heather began dancing in high school, with choreographed hip hop dance routines as a cheerleader and member of the dance drill team. In college, she took a general dance course for fun, which exposed her to multiple dance styles including ballet, modern, and jazz, and from there she has gone on to study belly dance through various avenues including formal weekly classes, workshops, DVDs, and personal study. Heather later got serious about her long time off and on fling with the dance form, and has been studying belly dance intensively since 2009, and she continues to study multiple styles of dance and both Salimpour formats. Heather earned her Level 1 certification in the Suhaila Salimpour format in April 2013, Level 1 certification in the Jamila Salimpour format in April 2014, and is currently working on Level 2 material for both formats. Woah! I’m really enjoying the template/theme of this blog. It’s simple, yet effective. A lot of times it’s very hard to get that “perfect balance” between usability and appearance. I must say that you’ve done a very good job with this. In addition, the blog loads extremely quick for me on Chrome. Superb Blog!